I think it’s a good thing to want to promote the brands of the country where you live, and it’s also a good idea to challenge yourself to style them a little differently if there’s a particular “look” that’s associated with that brand. 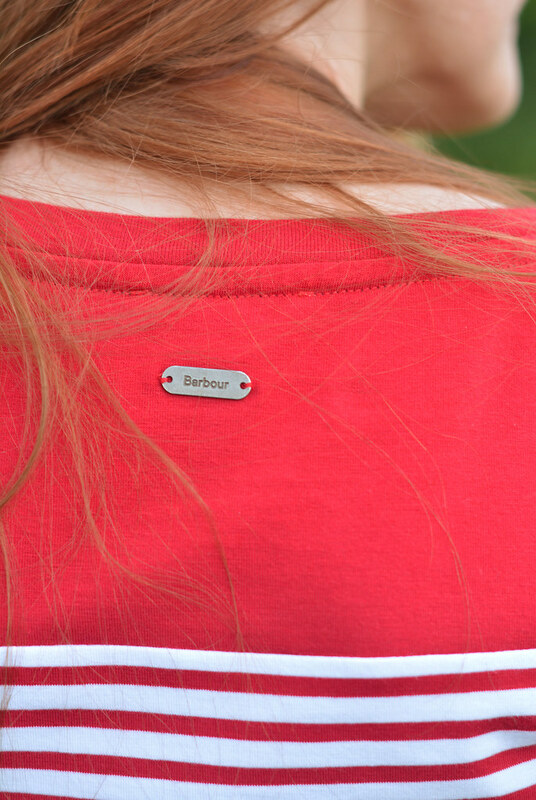 Barbour, for instance, conjures up images of hikes through the British countryside (with a Landrover and Labrador in tow) to me, but as a townie who now lives in the country I wanted to style some Barbour pieces a little differently. 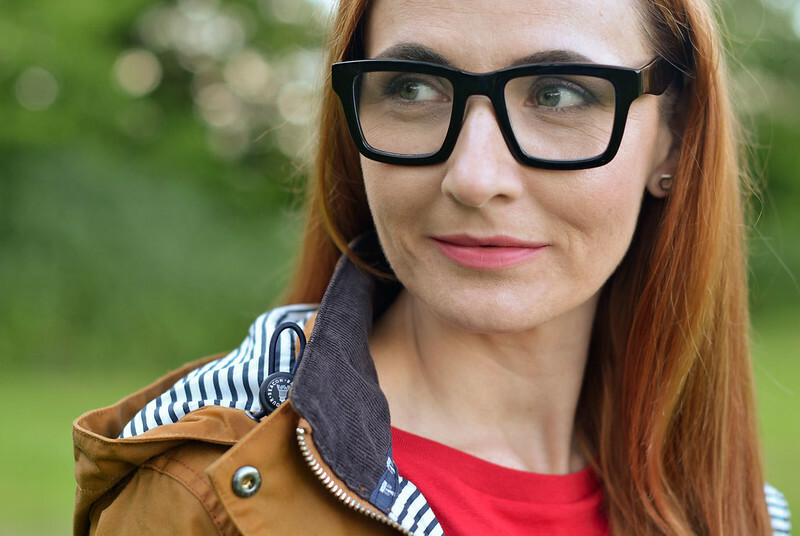 I was contacted by Country Attire, a British brand that sells “the essence of the British attitude to style”, sourcing heritage pieces from home and the rest of the world with lots of classic, quality brands and designs. 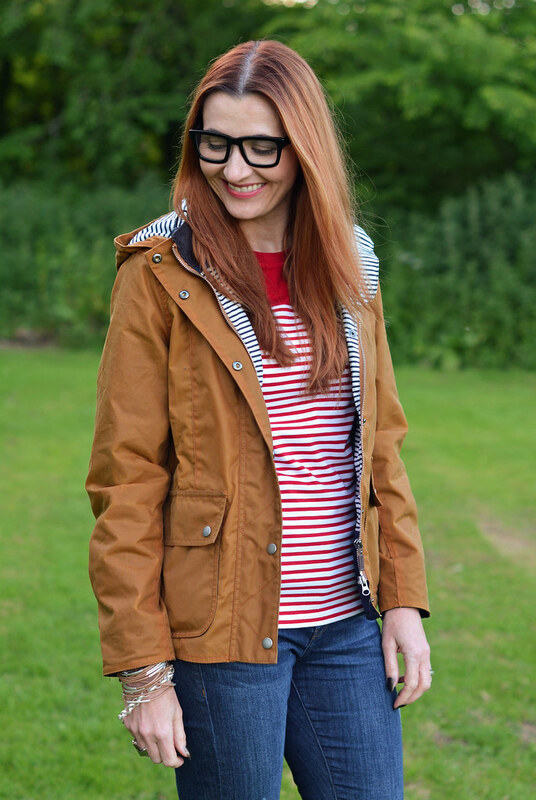 They offered me two designs from the women’s Barbour range to style, so I chose the Teesport Top in Chilli Red and the Godrevy Wax Jacket in Buckthorn Brown. Neither piece is something I’d associate with Barbour: I automatically think dark green or navy waxed jackets, but the warm gingery-brown of this jacket is so delicious and goes beautifully with red. And I’ll admit I didn’t even know they did t-shirts or tops. 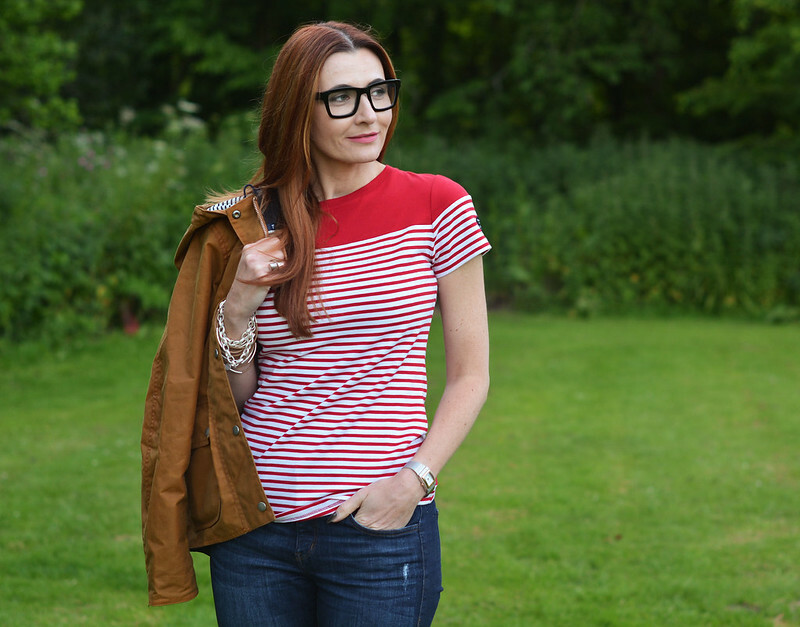 I didn’t count on (or plan) the unexpected pattern clash of the red stripes of the t-shirt and the blue stripes of the jacket’s lining, but it instantly gave the outfit a much more preppy feel, and we all know how much I love a preppy look in the summer…! Although in theory we shouldn’t need jackets in the UK in the summer, it’s often chilly in the evenings so this was the perfect jacket for an evening walk (I got quite cold on Saturday evening so I was glad I wore it). What Barbour is well known for, of course, is their waxed cotton jackets. 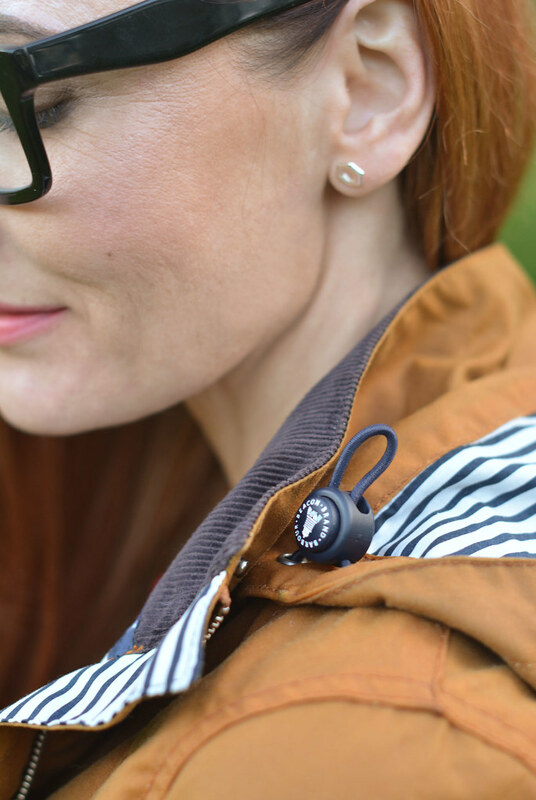 They’re water resistant and this one has a stud fastening storm flap and a detachable hood – like pockets on a dress, who doesn’t love a detachable hood? 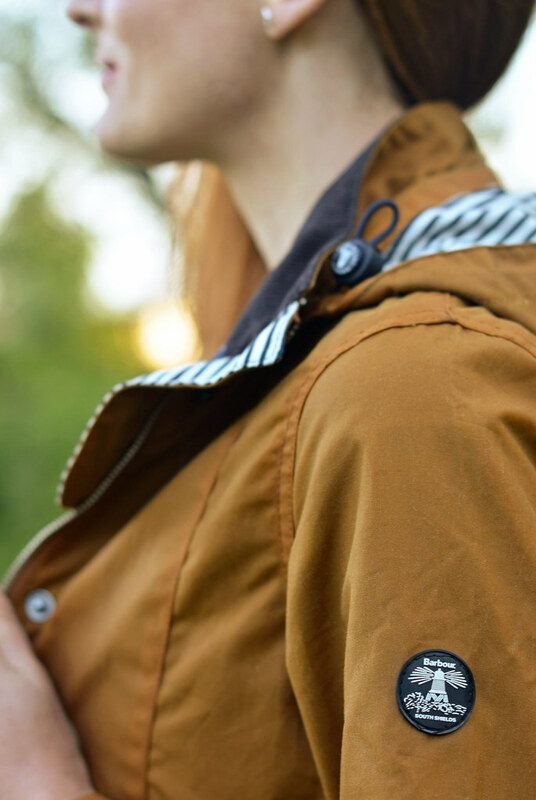 You’ll see in the photos below all the lovely details like the Barbour badge on the jacket sleeve and the t-shirt back, as well as the logo-ed toggles on the hood. It’s going to be a brilliant year-round jacket – I think I’ll be wearing this right into winter. Not forgetting the best bit for you: Both the t-shirt and jacket are on sale right now (35% off), and with Country Attire offering free delivery anywhere in the world you don’t want to miss out on getting your hands on some great British classics! What brands from your country do you love? How do you (or would you) style their classic or well-known designs? Do share in the comments! Disclosure: I have written this post in collaboration with Country Attire (click here for my full disclosure). All content is original, however, and opinions are my own and 100% honest. Next Post Not Dressed As Lamb YouTube Channel Launch Q&A | Ask Me Anything! I love the color of that jacket with the red and white stripes! So fun! Hehe thank you so much Vicki!! I love this look on you Catherine — classic British prep blended with your signature cool-girl vibe. I love the glasses especially! Like you I think the colour of the jacket is gorgeous. 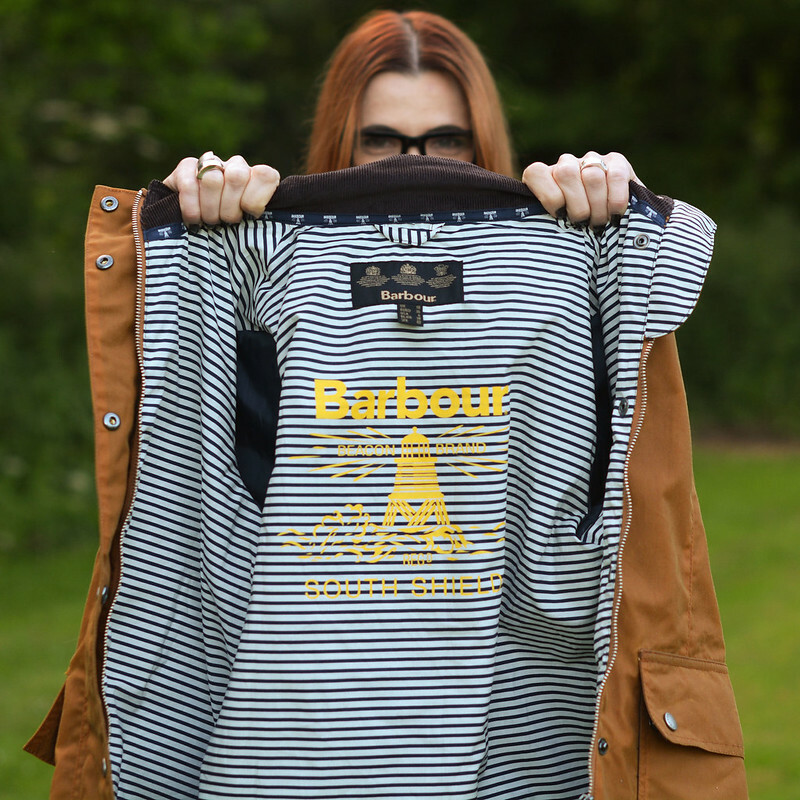 I do like Barbour; I had one of their jackets when I was 14, and have been hankering another ever since. Joules and Boden are also staples for me…. Love this summer look, really cute for a day out with the family! I love that jacket! I need a light jacket for our bipolar weather here in Houston, Texas! love love love this catherine, you look stunning as always sweetie! I tried on a Barbour trench in Berlin last summer – I haven't forgotten it… sigh. I really want a barbour jacket like that!! Unfortunately, in Texas I can't really justify the purchase 🙁 You look great! what a great jacket, love the colour and perfect with your colouring. Tee is a great contrast.